Columbia City Gallery is pleased to present New Year, New Work in the Main Gallery (featuring Stephanie Dickie, Hannah Voss and new member artist Michael Lowe) and Africa: The Mother of Us All in the Guest Gallery, which features internationally lauded Kenyan artist Beatrice Wanjiku Njoroge. In the Main Gallery: New Year, New Work, features mixed-media artist Stephanie Dickie, experimental enamellist Hannah Voss and contemporary painter Michael Lowe. Stephanie Dickie will be ushering in the New Year with subdued collage meditations that reflect her peaceful spirit (shown right). Michael Lowe, an artist new to the gallery, will present a series of his placid paintings. Hannah Voss introduces an enamel cracking technique using powdery white enamels on top of colored glass, resulting in a mysterious combination akin to the ceramic raku process. In the Guest Gallery: Africa: The Mother of Us All, features dynamic work from 12 contemporary Kenyan artists. The gallery is proud to introduce internationally lauded artist Beatrice Wanjiku Njoroge, one of the few female artists from Kenya to gain global recognition. About Columbia City Gallery: Since 1999, Columbia City Gallery has provided crucial exhibition and community arts space as the only nonprofit artists' cooperative in Southeast Seattle. The gallery has been showcasing the work of its Seattle member artists as well as a diverse selection of local guest artists. 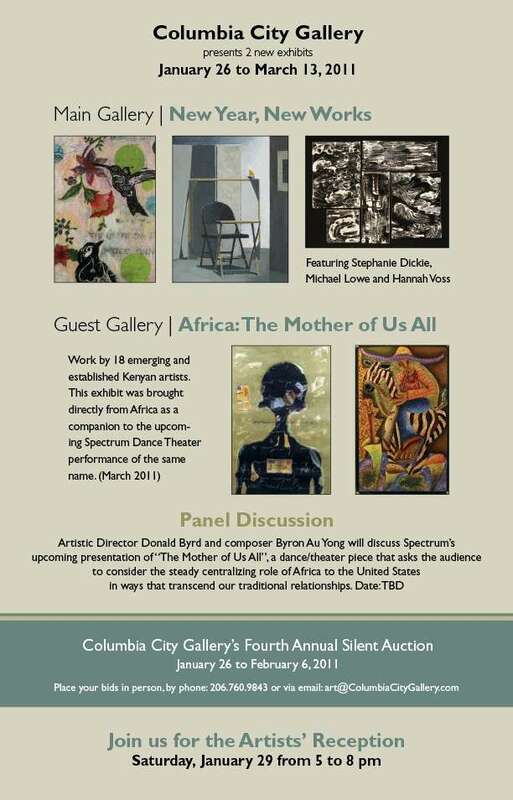 The Columbia City Gallery is a program of SEEDArts. Gallery hours are Wednesday to Friday, 12 - 8pm, Saturdays & Sundays, 10a - 6p. 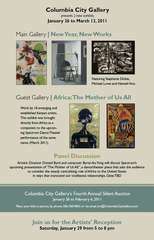 For a complete schedule, visit ColumbiaCityGallery.com. Please visit ColumbiaCityGallery.com for information about member artists featured in New Year, New Work.